The perfect beginner serger apron. 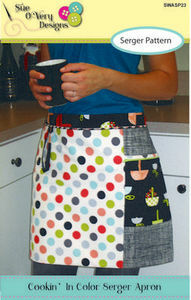 Serger apron includes pocket with zipper detail, towel loop, nice long ties and tons of tricks! Final dimensions: 25in wide x16in tall.